Would you prefer to listen to this chapter? Click / Tap Here! The morning sun glinted weakly through the gaps in the walls of her quarters and a gentle breeze washed over her. 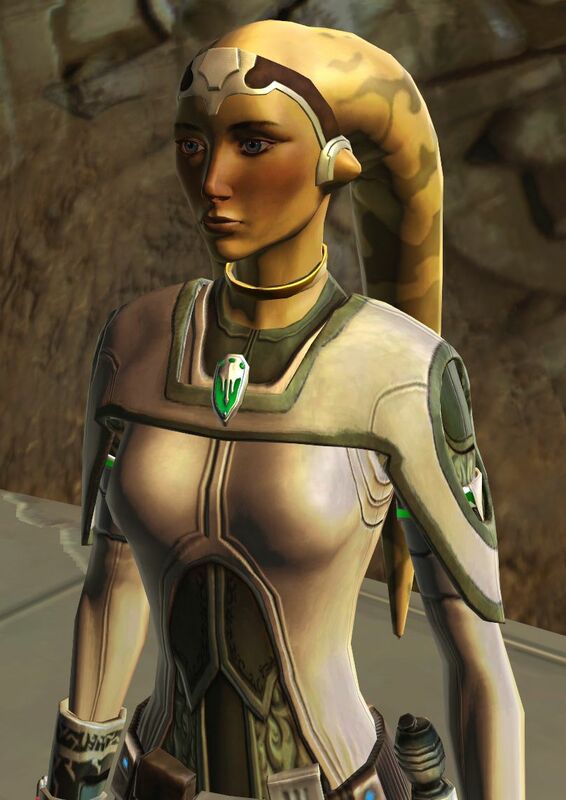 Her Lekku were wrapped around her shoulders like a serpentine embrace, protecting her from the outside world. Her eyelids gradually opened and apart from a headache, the result of nearly 24 hours bacta-induced sleep, Talitha’koum felt refreshed. She dragged herself into a sitting position and wrapped the bedsheet around her still-achy legs. She took a few deep breaths, inhaling the fresh morning air, which she knew would not last long once the scorch of the Korriban sun took hold. The Force once more embraced her and she smiled. The horrors of the previous day still plagued her mind, but she knew she had overcome where others had doubted her. It was proving others wrong that the Twi’lek found the most rewarding. That and being one step closer to leaving this awful place…, she mused. Swinging her lithe legs over the edge of the bed she stood up and stretched, a few joints cracking and popping as she did. Making her way over to the washroom, she took a moment to contemplate her reflexion in the mirror. Only a few faint bruises remained from the ordeal of the last Sith Trial. The most permanent wounds are those which cannot be seen with the eye. A line from a class she had been forced to attend on Information Extraction – a questionable combination of medical inducement and sorcery to get information out of the enemy. If she didn’t want to take part in torture she would have to find another way to the truth to please her Overseers. After a quick wash she put on her favourite, comforting clothes. Today was her last day off in weeks – but at least study would take the place of combat for the next few days. Her apparel of choice was a leathery material, dyed white with green edges. It hugged her shape, but more importantly, comforted her spirit. Pulling on a matching skirt, she then reached for her jewelled head-band, her only keepsake from Ryloth. A memory of what was once home. Pushing the thoughts of sadness away, she placed it delicately on her head. All Sith Inquisitors upon completing the War Blade Trial are issued with this. It is a Force Focus. Keep it with you at all times. You will learn its power in your next combat class. “Hmm. Almost civilised, my lord.”, she smiled slyly. Following the intructions she lifted the lid and retrieved the diamond-shaped device from inside. She balanced it on her right palm and could almost feel it pulsing with an energy stronger than her own. She clipped it to her belt and made her way to Lord Vitae’s office. “Welcome Talitha, please come in and shut the door. We don’t want to be disturbed.”, Restita Vitae instructed pleasantly. “Yes, m’lord”, the Twi’lek replied, pushing the button that shut the door with the familiar hiss. She made her way uncertainly to the Sith Lord’s desk and took her seat opposite the Overseer. “Yes m’lord, I just find it unusual that you use my name and not ‘slave’ or ‘Acolyte’. Why?”, she hesitantly queried. “You will soon find I am not like the other Overseers. Unlike them, I believe your identity is of greater value and greater strength than your title or position. With that in mind, please don’t call me Overseer or M’Lord. Restita will do.”, she said kindly but firmly. Talitha nodded, unsure what to make of this sudden show of personal touch. And the words at least made her wary. Restita pushed aside some of the parchments and relics that lay on her desk and rested her hands on the surface, allowing her shoulders to relax. These opportunities were rare, and she didn’t want to mess up this particular one. “Today is an introduction to what many Sith will tell you is vital to the work we do. Deception.”, she started slowly. “And I’m supposed to trust you, despite what you have said?” Talitha probed. “Well met, please continue.”, the Twi’lek motioned lazily with her hand and sat back in the chair. Restita took a deep breath and closed her eyes for a second, sensing the Force and trying to take in the presence of the cagey Twi’lek. The words sought to strike the Twi’lek with fear. She had not realised she was known that well, her efforts at outward obediance seemed to have been fruitless. “What happens to me now?”, the Twi’lek looked guiltily at the Overseer, all to aware of her powers being a Sith Lord. Was this the end? Unconsciously, her fingers played with the Focus on her belt, the self-defence instinct creeping back into her muscles. Restita Vitae cursed herself. She never had been good at diplomacy – and this reaction was not what she had in mind. “Please, relax. If you don’t befriend me, surviving your final trials will be almost impossible. Reach out to me with the Force. What do you feel?”, she questioned. Talitha tried to relax and reached out to the Sith Lord. Where others had blocked her access, she felt an openness. Where there was hatred, she found care. And, most surprising of all, she found light where she was used to darkness. She opened her eyes and met those of the Sith Overseer. “How is this possible?”, she whispered. The Overseer let out a sigh of relief and closed herself back off again to any prying senses in the Academy. At once the Twi’lek understood. She reached for a datapad and typed in her encryption key. Meeting the eyes of her new mentor she nodded – and they began.